Brock Lesnar and Paul Heyman head to the ring. The crowd boos as Lesnar smiles and holds up the Universal Title. Heyman says responds to Seth Rollins’ statement last week that Lesnar has trouble with smaller opponents. Heyman lists some of the smaller men that Lesnar has defeated as a rebuttal. Heyman also thinks Rollins is crazy to want to fight Drew McIntyre tonight. Drew McIntyre comes out to the stage. McIntyre talks about how he brutalized Roman Reigns and Dean Ambrose last week. He then tells Lesnar that he might want Heyman to find him another opponent for Wrestlemania after Drew brutalizes Rollins tonight. Rollins runs out and attacks McIntyre with a chair. Some referees try to stop Rollins, but Rollins just hits McIntyre more. Rollins walks down and enters the ring. Heyman and Lesnar leave, but Lesnar looks like he wants to get back into the ring. Heyman convinces Lesnar not to confront Rollins,so Heyman and Lesnar leave the ring area. Lio Rush puts the IC Title around Bobby Lashley’s waist. Finn Balor heads to the ring. He begins to talk about taking back the IC Title when he is quickly interrupted by Lashley and Rush. In the ring, Rush tells Lashley to show Balor his new favorite pose. Lashley holds up the IC Title. Balor says he’ll get the title back soon, but tonight, Balor’s partner wants to get his hands on both Rush and Lashley. Braun Strowman heads to the ring. This whole match just seemed like an excuse to see Strowman beat up Rush. I’m not sure how this helps further the feud between Balor and Lashley. Ronda Rousey and her husband Travis Browne hold hands as they walk in the back. Referee John Cone tells Ronda she’s late. He also informs Rousey that management has hired extra security so there won’t be another incident like last week. Rousey is unimpressed. Alexa Bliss comes out to the stage for A Moment of Bliss. Alexa’s guest tonight is Elias. Elias comes out playing his guitar. Once he sits down, Alexa tells him that this is a safe space. He is free to make his announcement without fear of being interrupted. Elias announces that he will be the featured musical guest at Wrestlemania. Alexa asks Elias about last year’s Wrestlemania, and he says that is what is inspiring him this year. This year’s performance will be the best performance of all time. And if anyone dares to interrupt him… No Way Jose’s conga line interrupts Elias. Leading Jose’s conga line are Otis Dozovic and Tucker Knight. Alexa is upset that Otis brought the conga line out too early. Elias walks up to Otis, but as Elias threatens Otis, No Way Jose (in a mask) attacks Elias from behind. Jose removes his mask and heads to the ring. This was okay. It was unsurprising, but it was done well for what it was. Kurt Angle heads to the ring. There are many superstars he would like to face, but there is only one man he really wants to beat. That man is Baron Corbin. Angle vows to make Corbin tap at Wrestlemania. Very good match. As expected, these two men match up incredibly well. I would’ve liked for this match to go one a lot longer, because what we got here tonight was a lot of fun to watch. The intensity picked up as it went along, and there was a series of nice counters late in the match. After the match, Baron Corbin comes out to the stage. Corbin says it felt good to humiliate Angle when he was GM, but it will feel even better to humiliate Angle in his very last match. Corbin smiles and walks away. Last week, Drew McIntyre attacked Roman Reigns and tried to injure him. Later that night, McIntyre beat up Dean Ambrose and tried to injure him as well in a Falls Count Anywhere match. Sasha Banks and Bayley head to the ring. Baron Corbin discusses something with The Revival. Apollo Crews walks up and tells Corbin that he’d like a chance to shut Corbin up before Angle shuts Corbin up at Wrestlemania. Corbin tries to talk, but Crews interrupts him repeatedly until Corbin agrees to a match. Also, nobody likes Corbin. In the ring, Charly Caruso asks Sasha and Bayley if there’s any truth to the claim from the IIconics that the champs are avoiding them. Bayley says they aren’t avoiding anyone, and they’ll be making an appearance on SmackDown tomorrow night. Sasha starts to talk about Wrestlemania when Natalya and Beth Phoenix come out and head to the ring. Beth tells Bayley and Sasha that she respects them both. She has enjoyed watching the champs compete in her role as a commentator. Beth says she was content in her new role until she saw Nia Jax and Tamina take advantage of people. Jax and Tamina awoke the dragon. So now, maybe Beth and Natalya could be tag champs. Beth officially challenges the champs to a title match at Wrestlemania. Bayley says it would be a huge honor, but she wonders if Beth needs more time to prepare. The women’s division in WWE has evolved since Beth competed full time. Natalya reminds Bayley that Beth is a Hall of Famer. Sasha tells Natalya that Beth is the only reason Natalya even has a chance of having a match at Wrestlemania. Natalya slaps Sasha. Sasha attacks Natalya. Bayley gets involved, and Beth shoves Bayley. This match barely got going before Nia Jax came out to say stuff from the stage. As Jax distracted everyone, Tamina attacked people at ringside, ending the match. Mojo Rawley talks to himself in the mirror again. What good is potential if you don’t do anything with it? Why can’t Mojo figure it out? Good match. It went about like you’d expect. Ricochet started strong, Mahal came back by using his power and some distractions from the Singh brothers, then Ricochet started to fly towards the end of the match. I enjoyed it. Ronda Rousey heads to the ring. Dasha Fuentes asks Seth Rollins if it was a good idea to attack Drew McIntyre earlier tonight. Rollins says that if you hurt his brothers, prepare to get hurt. Tonight is for Dean and Roman. 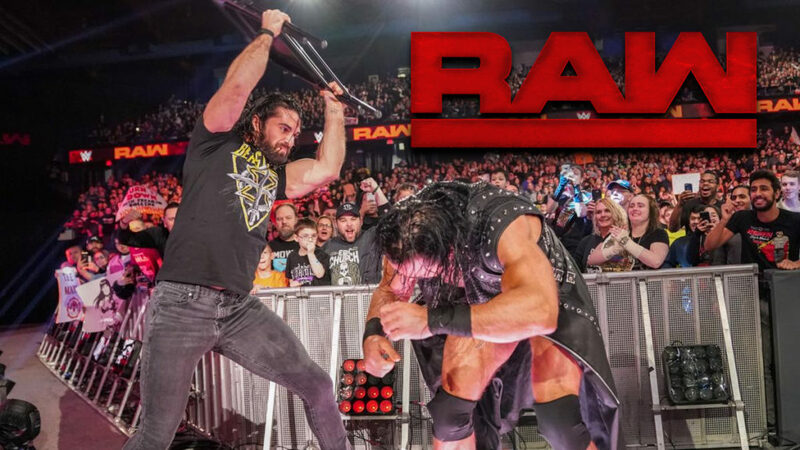 Rollins isn’t scared of Brock or Drew, and he’s not afraid of fighting fire with fire. Charly Caruso asks Dana Brooke if she knows what she’s getting into facing Ronda Rousey tonight. Brooke says she isn’t naive. She might not be better than Rousey, but she only has to be better than her for three seconds tonight. This wasn’t really a match, it was just another chance to show how dangerous Rousey is. After the match, Rousey refuses to let Dana Brooke out of her arm bar. Ronda lets go when a second (fake) referee runs to the ring. The (fake) referee gets shoved by Rousey. Rousey goes to ringside and kisses her husband. Security runs down, and one of the security guards puts his hands on Rousey. Rousey takes the guy down, and Ronda’s husband punches another security guy. The husband pulls Rousey out into the crowd, and the two of them leave together. I liked the finish to this. Crews looked good throughout, but it felt like it was heading to an expected finish with Corbin building some momentum. They surprised me with the finish, and I enjoyed the match for that reason. Michael Cole interviews Batista via a video feed from Batista’s home. Cole wants to know why Batista has challenged Triple H. Batista says his problems with Triple H go back even before Evolution. He says Triple uses people, and he had groomed Batista to be his muscle since the day he joined WWE. Batista says he left WWE because Triple H was supposed to be his friend, but he was always holding Batista down. Triple H has always been jealous of Batista. Outside of WWE, Batista became world famous. Now, Batista has the power. Cole says Triple H has always been fair to him which gets a rise out of Batista. Batista says Triple H has always manipulated people. One day, Vince will realize who Triple H really is and fire him, but before that, Batista is going to end Triple H’s in-ring career. Charly Caruso welcomes Braun Strowman. Strowman says Michael Che and Colin Jost disrespected him and WWE, so he is going to give them his hands at Wrestlemania. Alexa Bliss walks up and says that at the host of Wrestlemania, she wants to make peace between Strowman, Che, and Jost. Strowman says Alexa has one week. Drew McIntyre heads to the ring. He says actions speak louder than words, so he has footage shown of his attack on Reigns last week. Drew then says that he personally broke The Shield. He revealed the truth last week when he beat up Reigns. The truth is that this is McIntyre’s yard. McIntyre now would like to speak to “Joe the man.” Joe the man is sitting at home because of Drew McIntyre. He says that if Reigns wants to prove himself to the people, then he should fight McIntyre at Wrestlemania. McIntyre promises to destroy Reigns if he accepts the challenge. Reigns will never beat McIntyre. In the back, Seth Rollins says he attacked McIntyre with a chair earlier because of exactly what McIntyre is talking about. That was for Rollins’ brothers. This next match is for Rollins. Rollins heads to the ring, but McIntyre meets him on the ramp. The two men brawl as officials try to break them up. Rollins breaks away and heads to the ring as the show goes to a commercial break. Good match. The shenanigans at the end of the match were kind of expected, but that didn’t take too much away from the match. This was a good fight between two really good guys. They both did exactly what they needed to do heading into Wrestlemania. Rollins showed perseverance and power against a bigger opponent, and McIntyre showed his ruthlessness and aggression. I liked it. This was a pretty good show. It felt really long, but most RAWs do. I liked most of it, and the only complaints I really have are the ones I’ve had with most RAWs lately. I really enjoyed parts of the show though (Angle, Ricochet, and Phoenix spring immediately to mind). This was the best wrestling match of the night. Easily.